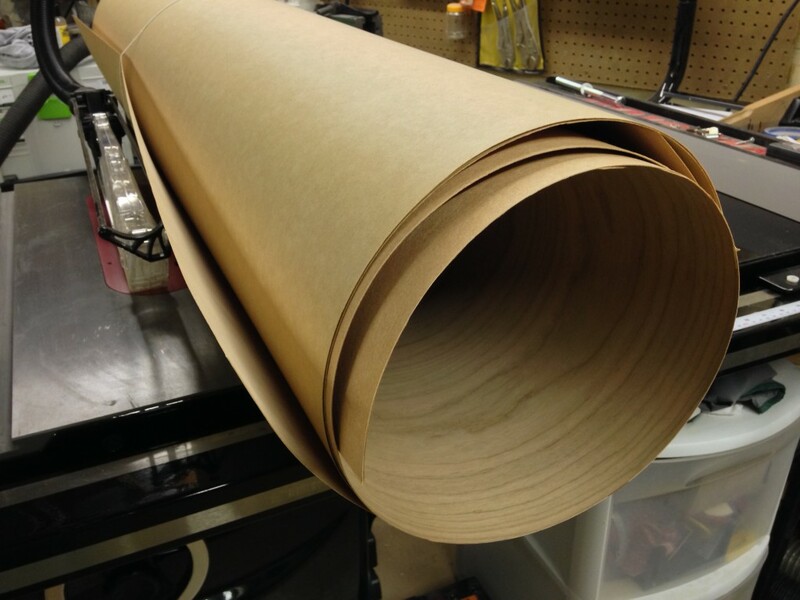 4’x8′ sheet of vertical grain fir and 4’x4′ sheet of cherry waiting for inspiration to strike! I remember early in my woodworking experience thinking that working with veneers in a project was somehow like cheating. Of course at the time I had very little understanding of how much solid wood moved and especially no idea of how expensive highly figured and exotic woods could be…in a nutshell, I was pretty naive! My first experience with veneers is probably the same as many of you, an edge treatment for plywood. Like me, you probably used some of those pre-glued versions that are heat activated and surprisingly messy if you’re not careful. As an aside, it’s never good when you use the same iron for laundry! My next experience with veneers was when the kids and I built some skateboards from a Roarockit kit (click on this link to checkout that post). This project led to my first experience with a vacuum press, a small one but a great experience none-the-less. I’ve since had mixed results with this technique, but that’s probably more to do with my lack of experience versus the materials or technique. Now a days I’m starting to appreciate even more the flexibility and possibilities that exist using veneers. Not just for it’s stability and versatility, but especially for the possibility of saving me money. Yes, I could find similar figured and exotics as a solid wood, but the cost would be dramatically higher and the thought of a mis-cut or just the waste itself is more than I care to think about. The one obstacle I still run into with veneers is understanding all the different types out there. Not the variety of species available as veneers, but more like the types of backings attached to it and understanding which adhesive works best in specific applications. Recently I heard from the folks over at Oakwood Veneer and they were nice enough to send me a couple of samples (see picture above) they carry. They’re absolutely beautiful, and thanks to the videos they produced for their YouTube channel I’m feeling a lot more confident that whatever I decide to use the veneers on I’ll be able to choose the right substrate to attach them to and the best adhesive to ensure the job goes well. If you’re looking for more information on veneering checkout Oakwood’s YouTube Channel for a great primer on selecting the right veneer and adhesive for your next project. And if you’re looking for a great resource to purchase veneers of all kinds, including 29 different species of edgebanding, visit Oakwood Veneer’s website at www.oakwoodveneer.com. We were happy to send the sheets for you to play with. We can’t wait to see what kind of projects you come up with.